Cinco De Mayo, 5th of May, is a good excuse to eat Mexican food. While tacos are easy, I thought I would mix things up a bit and add some variety but not with any added work. I have nick named this dinner, “plug it in and wait”. 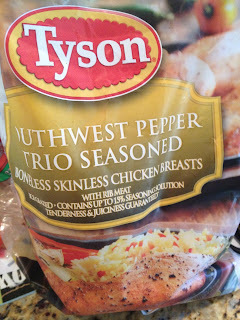 Along with the Smokey Steakhouse Chicken breasts I used in this post, I also received a bag of Tyson individually frozen Chicken breasts in the Southwest Trio Seasoned Pepper variety from the same CBIAS campaign . The Southwest Trio seasoned Pepper variety is also brand new and exclusive to Walmart at this time. 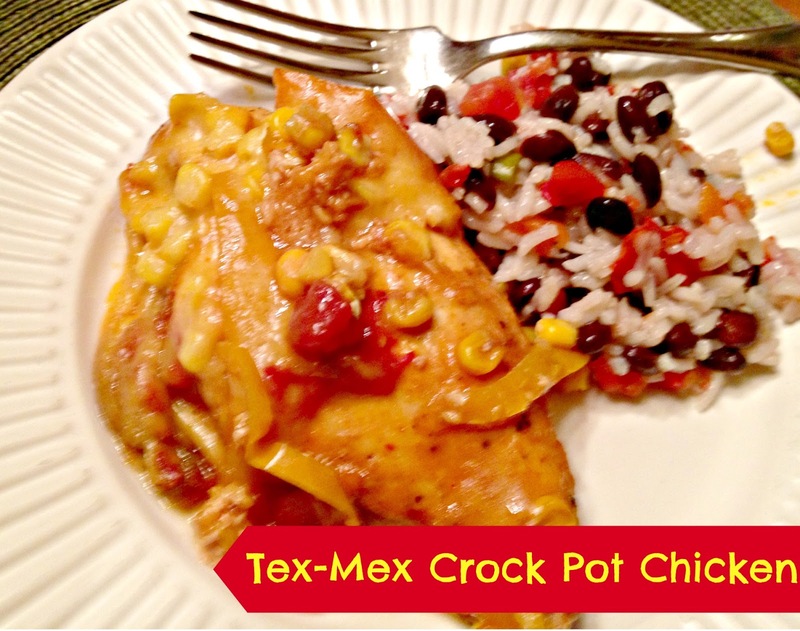 You will want to add this chicken crock pot recipe to your dinner rotation. Here is a super easy and flavorful recipe that you can plug in the am and enjoy with the family at night, with a margarita of course. I love this recipe I adapted from the Crock Pot cookbook that came with my brand new Crock Pot 6.5 QT MyTime slow cooker also known as Smart Cooking technology This thing is amazing too. No more worrying about when to plug in the crock pot in order to have it ready in time or not over cooked. 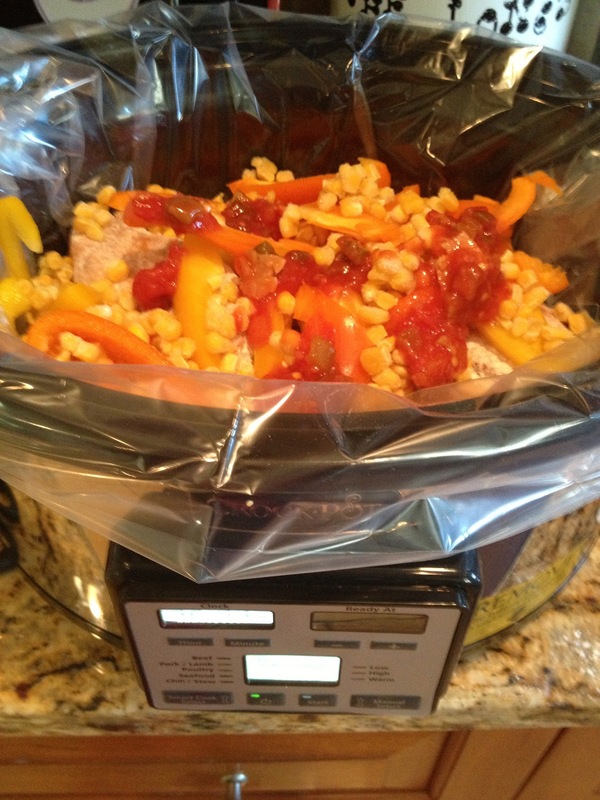 You simply put your food in the crock pot and let it know when you want dinner to be served. I will say no more, life just got simpler. I regress, we are talking about Cinco De Mayo and dinner recipes right! Look for this packaging at your local Walmart stores. Tell me this is not easy, simply toss your FROZEN chicken breasts in flour and put them in your crock pot. I used a crock Pot liner for this chicken recipe since this is a brand new machine. Dump all the ingredients into your crock pot. Anyone sweating from all the work yet?? Told you cooking is easy using a crock pot recipe. This is such an easy recipe especially since I had the pre-seasoned Tyson Chicken breasts. You probably have most of these things in the house already. NO worries about thawing your chicken breasts either, added my frozen chicken breasts right into the crock pot, and they were perfect. I also made a quick side dish in our rice cooker. Thus the plug it in a wait nickname. I have never made anything but plain rice in our rice cooker so this was an experiment that I was pretty excited about. Consensus was 4 stars all around. This would even be good shredded and put inside tortillas. So sit back and let your kitchen appliances do the work this Cinco de Mayo or any night you are in the mood for a little Tex-Mex (which is weekly in our house). 2.Cook on LOW 6 to 8 hours (or on HIGH 3 to 4 hours). If you don’t have a rice cooker just cook the rice with all the add ins per the rice directions. What do you like to make on Cinco De Mayo? Good Lord this recipe looks almost too simple and absolutely delish. I honestly think I may make this tonight. This recipe looks so good, and definitely a way to change things up in the Mexican food department as an alternative to the tried and true (and sometimes boring) taco. Thanks for sharing the recipe! Looks and sounds amazing! I love mexican food-what a terrific idea! I can’t wait to,try this and so hope my area Walmart has the chicken! yes both flavors are in the VA area! In the frozen chicken section! thanks for stopping by kristie going to check your blog now too. super easy is what I like about it, frozen chicken right into the pot! That looks delicious!! We love southwest/mexican style food here, so I can imaginen this would go over well! This sounds – and looks – like a great recipe, I must try it! My kids love food like this!! Going to try the new Tyson chicken flavor this weekend. Great idea!! that looks amazing! I am going to buy that! 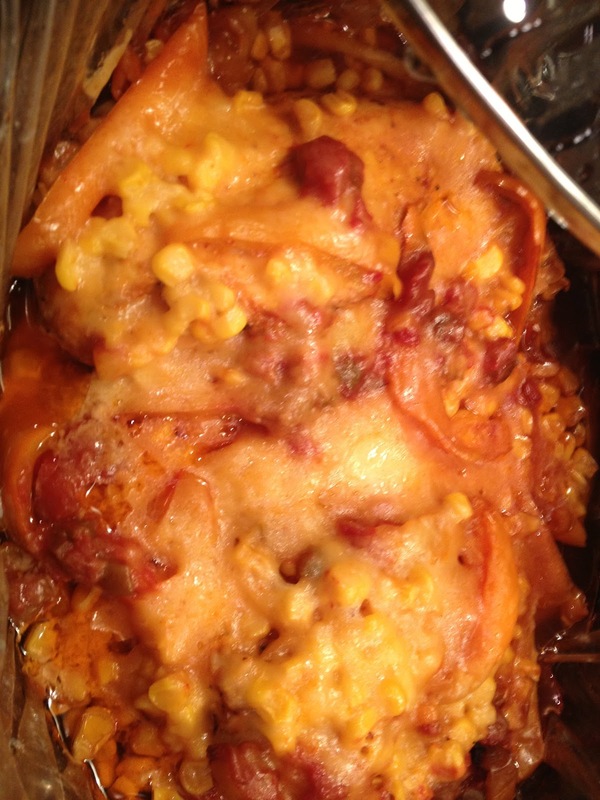 love the crock pot cooking and I know my family will like these flavors. thanks for sharing about Tyson, I probably would not have seen them in the store. Yum that looks great! I love Tyson chicken!